When President Franklin D. Roosevelt authorized the repealed Prohibition in 1933, there was a catch— local governments nationwide still had the power to prohibit the sales of alcohol. Goodfield was among those that chose to continue an alcohol prohibition, that is, until last week, when a majority of voters opted to repeal the 85-year-old ban, which was worded in a way that a No vote was vote in favor of repeal. “Shall the prohibition of the sale at retail of alcoholic liquor be continued in the Village of Goodfield, Illinois?” read the ballot question. A small portion of voters in Woodford and Tazewell Counties received ballots which included the referendum; 276 people voted in favor of the referendum, 145 people voted against. With a population of around 1,000 people, only a few Goodfield businesses will likely leverage the opportunity to serve alcohol at this time. According to the Village of Goodfield website, those businesses are The Barn III, Freedom Oil, Shell Oil and The Busy Corner. The Busy Corner is a well-known family restaurant, known for the homemade pies that fill the diner’s glass showcase. Co-owner, Brian Vollmer remains on the fence about serving alcohol. The Freedom Oil station, and the adjoining Shell station, may serve packaged liquor, once the village board establishes the framework for liquor sales. In other areas where liquor sales are allowed, Freedom and Shell stations serve packaged liquor. The referendum is most beneficial to The Barn III, formerly Conklin’s Dinner Theatre, which was founded in 1974. It closed in 2015 after damaging winds essentially destroyed the venue, but it will reopen in February 2019. Since it’s inceptions, guests were welcome to bring their own alcoholic beverages to the theatre, but the owners could not sell and serve alcohol. Owners attempted, and failed, three times to have the liquor ban repealed. In reconstruction, owner Abby Reel incorporated fitness and dance studios, as well as an event venue. 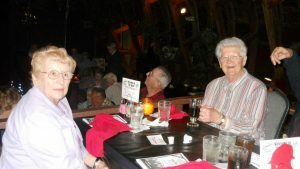 The Barn III will host weddings, high school and family reunions and other gatherings in which liquor sales are key, particularly at the dinner theatre. Goodfield is located along Interstate 74, situated between Peoria and Bloomington. Whether liquor stores or taverns may open there will be left up to the village board during upcoming meetings. The board is comprised of six trustees and village president Ross Hohulin. They meet next at 7 p.m., Nov. 15 at the village hall on Eureka Street.